The kids had their primary presentation on Sunday and all did great, naturally. Benjamin sang every song and said his part very clearly. Miriam wasn't terribly thrilled with her part, which was a short five-word sentence ("Jesus Christ loved the children," or something like that), especially considering Benjamin got to recite an entire verse of scripture (much longer than five words, mind you). Rachel had no speaking part at all. She volunteered for a special musical number, which I responded to with a bit of surprise. "What?" she asked when she saw my surprised face. "Nothing," I said, trying to look like I thought this was normal behaviour for her. "I just am impressed you volunteered to sing in a small group." "I like singing now," she said. "Okay," I said. "That's great. Singing is great." "...And they said if we volunteered to sing we wouldn't have to have a speaking part," she admitted. Still, I was happy for her to take part in a small musical number. She's a good kid. They're all good kids. My parents came to watch, along with Uncle Patrick. Andrew parents, of course, were there (since we live in their house we're in the same ward). Karen had gone early to play prelude (she's one of the ward organists) and had left her sweater across a row of seats to save them for us, knowing that the chapel would fill up quickly. Even with her going early we ended up on folding chairs in the overflow! She had walked over with the girls. And then Grandpa left with Benjamin. And finally Andrew and I showed up with the baby. By the time we got there my dad was already there, so we were just waiting for my mom and Patrick (who had to finish out the first hour of primary in their ward). They came, we watched the program, and then people started leaving. The kids all ran off to primary. Andrew's dad took Zoë to nursery. My dad left. My mom and brother left. Soon it was just me and Andrew and Alexander sitting in our row...with a mysterious blue sweater. Neither one of us knew whose sweater it was so we decided the best course of action would be to chase down my mom and brother to see if they knew (that way if it belonged with them they could take it). They, unfortunately, weren't sure whose it was either but decided it could by my dad's, so I sent it with them. But then they decided it probably wasn't his, I guess, so when they saw Reid walking home (he had to manage a big work project over the weekend) they stopped to ask him if the sweater was his. "No, that's Karen's," he said. I'm still not quite sure why they didn't just give him the sweater right then, but since Andrew and my mom both work at BYU it was still an easily solvable problem. My mom would leave the sweater in her car and Andrew would pick it up from her on Monday. But then he forgot to pick it up from her. So it was decided that Andrew would pick it up from her on Tuesday. And that was his last chance (at least this week) because today he flew to Grand Rapids, Michigan, for a conference (ARNOVA) and my mom still has Karen's sweater. Fortunately Karen has other sweaters. Anyway, the primary program went well and we were happy to have so many family members come to support the kids. Monday it was my turn to make a concerted effort to support my kids. Both Miriam and Rachel (who likes singing now) joined the school choir this year. Miriam is in the junior choir and Rachel is in the show choir so they rehearse on different days and, I believe, are learning different songs. However, they both learned a few patriotic songs for the school's Veteran's Day assembly—an assembly which was held at 9:20 in the morning (as if I have my life together enough to leave the house by 9:20 in the morning)! But somehow we (mostly) did it. I breezed into the school just a smidgen late, catching the second half of their first song and 100% (obviously) of their second (a medley of the fight songs for all the branches of the military). I spotted Miriam right away—they had the junior choir on risers in the front—but for the life of me I couldn't find Rachel (until the choir was dismissed to join their classmates) because the show choir was smushed off on either side (and I didn't even notice they were there so many no effort to search through the sea of faces to find my daughter). The assembly was...fine...except that Veteran's Day hurts my heart a little. I appreciate the efforts of those who literally put their life on the line for my freedoms. I really do. But November 11, to me, has always been more about remembering the atrocities of war and rededicating ourselves to promoting peace. Certainly we can honour our veterans (and the many who lost their lives to protect our freedoms and made peace possible) but LEST WE FORGET, guys! This assembly was a little too MAGA for me with ZERO mentions of peace but many about how STRONG this nation is. Oh, and they showed a YouTube video about Frances Scott Key that was...wildly inaccurate. A YouTube video. Unquestioned. Unvetted. In an educational environment. A YouTube video without any sources listed and an unknown creator. One that kept saying "Fort Henry" instead of Fort McHenry. After the assembly I took Zoë and Alexander back home and got so much accomplished. I did dishes and (believe it or not) tidied up a few things before glancing at the clock and noticing it was 11:00. It was nearly time to get Benjamin and I had a fussy baby on my hands. "We have just enough time to feed you before we need to go," I said to Alexander. And I sat down and nursed him until he was content. And then I put him back in his wrap, grabbed a few snacks to enjoy at the park, got Zoë into the stroller, and struck off to collect Benjamin. When we got to the park, however, I was surprised to see some kindergarten families already playing. Weird—because we were perfectly on time. "Oh, no!" I said. "It's Monday!" This time I completely missed the phone call from the school (and, you know, the alert I set on my phone to remind me to pick Benjamin up early on Mondays) because my phone had been tucked securely in the diaper bag all morning since leaving the house for the assembly. So instead of rushing over to pick up my poor forgotten child, I just moseyed on down to the school. So they called Andrew, who also didn't answer his phone. So they called Karen, who (thankfully) did answer her phone. She told them that I was on my way and had simply forgotten that it was Monday (and mentioned something about baby brain (not that she's witnessed me do anything forgetful, like load the washing machine, choose all the appropriate settings, and then neglect to actually start the cycle)). Benjamin was the very last child to be picked up on Monday (though he assured me that he wasn't the only one who'd been forgotten that day), but we went to the park to play and all was forgiven. After we got home I pulled out my phone to check my messages (like a responsible adult ("Hello Mrs. Heiss, we have little Benjamin here in the office and we're just wondering if you just forgot it was Monday and are still planning on picking Benjamin up. Or is there someone else you need us to call to come get him?") and there was a Facebook message from my friend Joy, wondering if she could stop by to see me that very afternoon. It was already the afternoon so I wrote back an emphatic "YES!" right away. Joy, who definitely lives up to her name, was one of my very best friends in high school and clearly that friendship is of the calibre that it has lasted a decade (and then some) past high school. I haven't seen her in forever, which is funny because "Joy! I haven't seen you in forever!" happens to be an inside joke from high school (I'm not even quite sure why). Anyway, Joy stopped by to see me! 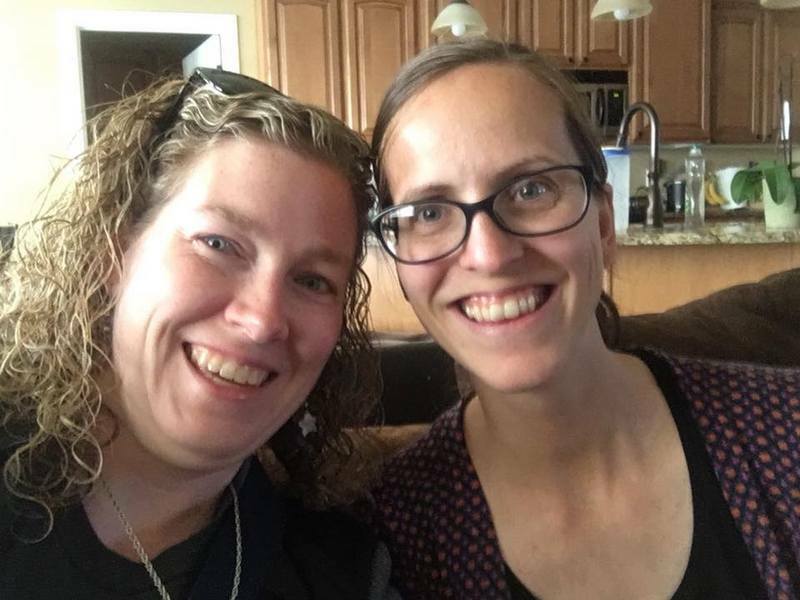 She was in Utah for one night only (and had a billion people to visit, I'm sure) so I felt very honoured that she chose to spend some of her time with me. Of course, we haven't seen each other in so long that she hasn't even met Zoë or Alexander, so she had to do that (I think the last time we saw her was at a Circle of Joy party shortly before we moved to North Carolina (when Benjamin was about Alexander's size)). It was so great to see her! We did not give the sweater to Reid because of the logistics of where we were and where he was while we were yelling at each other about the sweater. I should have thought to just pull into the driveway and wait for him to get there, but there was traffic making me nervous, and my brain had not caught up to the new information yet, so I just went!